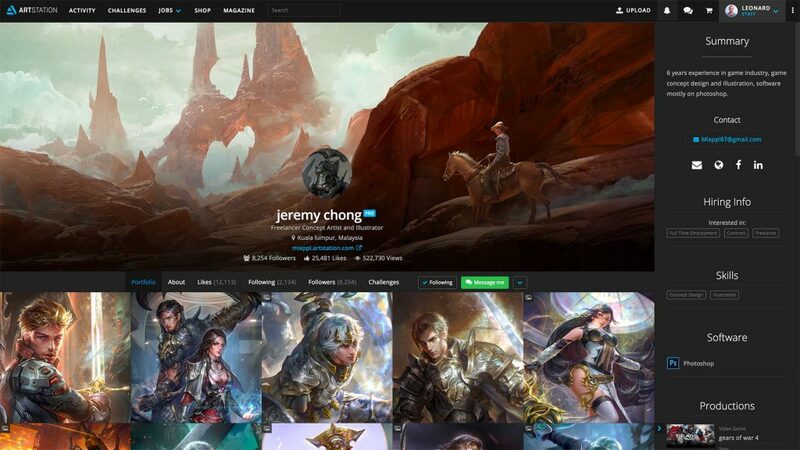 We’ve made many improvements to the user profiles on ArtStation recently! Also, if you haven’t already checked out the ArtStation App, please do! We’ve been making many improvements to them and continue to do heavy development on them. Get the app at your respective app store: Google Play, App Store. We’ve changed the profile URLs on ArtStation so that it’s now artstation.com/:username. Don’t worry – the old URL will redirect to the new ones, so don’t panic if you already published the URL on business cards, etc. This shorter URL is great and makes it easier to find artists on ArtStation. Screenshot from Jeremy Chong‘s profile. One of the problems we had with the previous profile on ArtStation was that information about the artist was tucked away in an About page. Because of this, people looking for artists always had an additional click to see this information. When researching with many artists, we found this to be a widespread problem. The updated profile now has a sidebar that shows on larger resolution (1920+) displays. By default, the sidebar is closed so that you can focus on the art. When the sidebar is open, it will remain open for all other profiles you visit until you close it. This is great for those of you who want to see information about artists at a glance and not have to click into an additional page. Currently the feature is in Beta. There is a poll to get feedback, so please leave your feedback on the sidebar. Pro members now have the option of setting a specific album to be their default (featured) album on the community profile. This is really great for situations where you only want specific or featured artwork to show, and then be able to hide all the other works into albums. To access this feature, click on “Portfolio display options” while viewing your profile and select a Default Album to display. Pro members can now set the visibility of albums on lists. Just like projects, you can now select if an album should be visible to the ArtStation.com community, your website or both. This is great for those of you who have specific albums that you want to show only on your website or community profile. Screenshot from Sylvain Sarrailh‘s profile. We’ve made significant improvements to the Manage Portfolio screen. 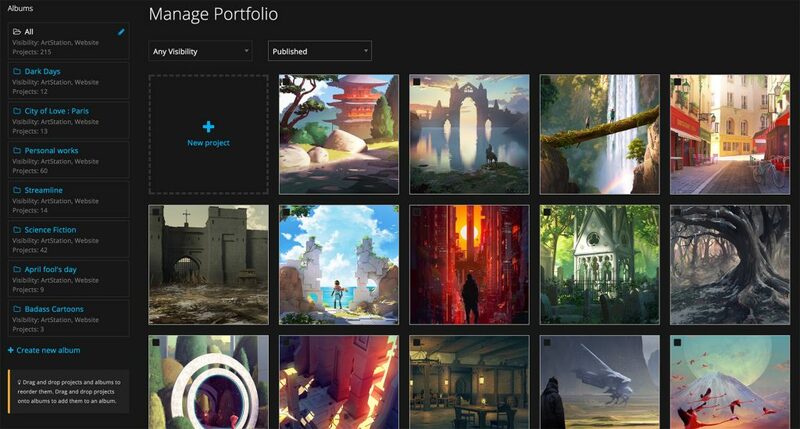 This screen lets you see your portfolio at a glance and be able to sort/reorder your projects and albums. Filter projects by their visibility – whether on ArtStation.com or on your website. Filter projects by status – published or draft. Batch assign to album – there are checkboxes on each project where you can select multiple projects and then assign them to a project. Reorder “All” album – you can now reorder the “All” album and Pro members can even turn off its visibility on album lists. 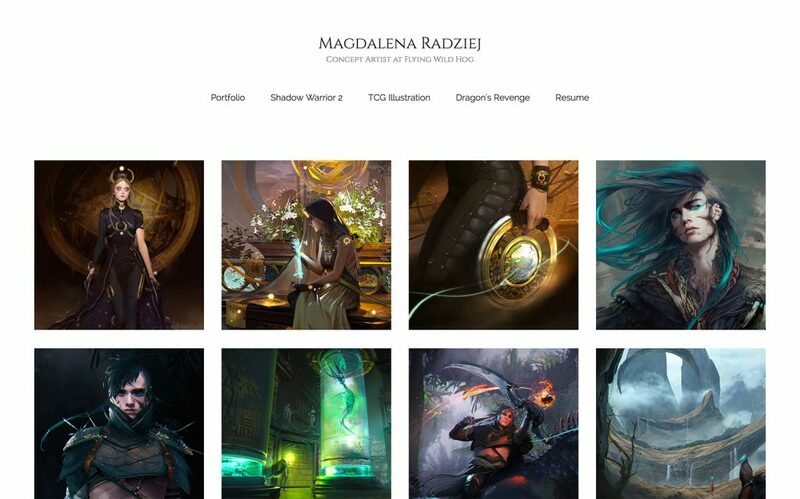 Magdalena Radziej using the Insta theme on Artstation pro. Check out the website. Select a default album to display on Basic, Mosaic and Insta themes. Adjust the height of home page images on Horizon theme. Next/Previous navigation on all themes have been improved to be more intuitive. Thanks again on following us on this ArtStation journey! If you have any questions, comments or concerns, feel free to reach out to us via support@artstation.com.